Description of "Who Am I? 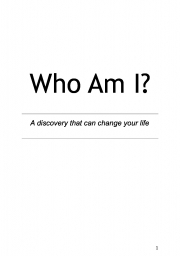 (eBook)"
"Who Am I?" is one of the most intriguing and important questions human beings have ever asked. In answer to this question lie the answers, not only to our own individual sorrow of fears, irritations, frustrations and anxiety, but also to the complex problems that we, as human race, face today. This book is based on a fact based journey that couple of Truth seekers undertook to discover what is living inside. What you find inside is a real, fact based, experiential path, that couple of Truth seekers took to uncover the phenomena that lives inside all human beings. Reviews of "Who Am I? (eBook)"